Today’s social networking world is overwhelming: You meet people online, talk to them, lose them for a month or two, then find them again. There should be better ways to keep up than trying to remember everything! Luckily, apps are popping up that allows for smarter outreach, by putting a social dashboard inside your inbox. These three helpful tools work by giving you information on each contact, effectively establishing your own little social network. If you have been looking for a more social way to interact with your contacts, or just don’t always remember names without faces attached, check these programs out. FullContact for Gmail has been named the best alternative to Rapportive after the latter became Linkedin’s Sales Navigator (as discussed below, Sales Navigator is still a useful Google Chrome extension if you spend a lot of time on Linkedin). FullContact for Gmail is an awesome tool allowing you to see social profiles, job titles, tags, and notes for each of your Gmail contact. 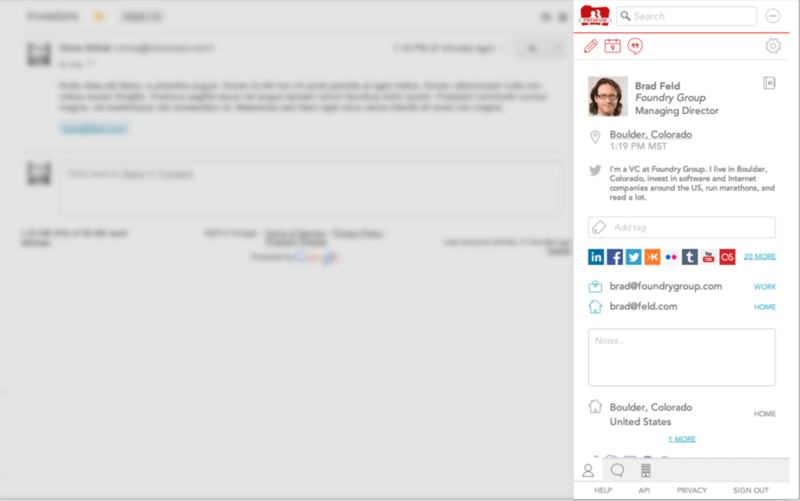 View recent tweets and company information without leaving your inbox. If you subscribe to FullContact for Teams ($9.99 /Month with a free trial available), you can use the extension to share contacts with team members, add notes for individual contacts, apply collaborative tags. The tool is one of the highest-sated extensions currently in Google Chrome web store. Integrate your Facebook, Twitter and LinkedIn emails inside of your inbox, and that is just a start. Discoverly is all about creating a more interactive email experience, not only adding that element to the email itself but also putting interactive live feeds within your range of sight. They also have security icons, allowing you to confirm the source of emails and quickly catch phishers posing as official parties. It works with Gmail, Yahoo and Outbox email clients, and you can download it for free. Formerly known as Rapportive, this Gmail client is the first program I ever came across. 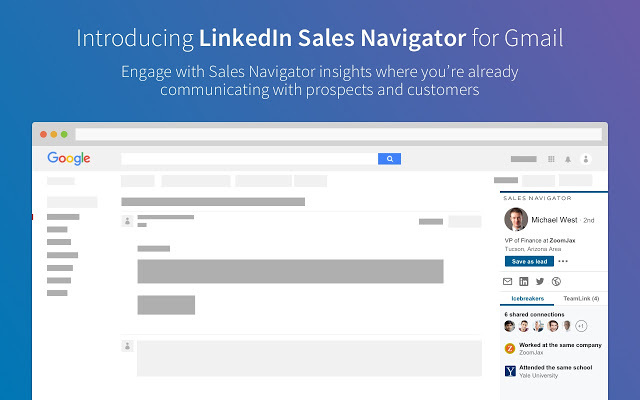 Since it became Linkedin Sales Navigator, it has lost some of its initial appeal (the product had shifted away from supporting other social networks) but it still remains a useful extension, especially if you spend a lot of time and effort building your Linkedin connections. It also makes sense if you already have Sales Navigator subscription which is required in order to use this product. This is a free tool, and you simply add it to Gmail. It can be customized, but the features are pretty straight forward. What Do Do With This Info? Alright, so you can get all these social and demographic tidbits about your contacts. What exactly are you supposed to do with all this data once you have it? Knowing things like their social activity, general location and work info is great, because it lets you better target the conversation. Do they live in the same city as you? Invite them out to lunch for some one on one networking. See that they are going to be attending a conference you are? Set up a meeting during it to get face time with people you normally wouldn’t. Just finding contacts at companies you want to be affiliated with can be a major benefit. At the very least, these tools can be a great way to organize your contacts, a list that can get very long and hard to keep track of. Anyone can see a real change in their engagement and outreach with one of these tools. They are quick, easy to use, and (mostly) free. Not to mention a fun way to keep up with social media in your personal life. Do you know of any good outreach tools for email clients? Have you been using one not on this list? Let us know in the comments, and be sure to include a link! I wish there was a Google Chrome extension for pre-populating the footer of every YouTube video with links pointing to any URL you desired, instead of having to put them in manually in every video description.